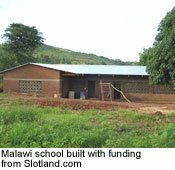 The rainy season has made it challenging, but the school in Malawi being built with funding from Slotland.com is almost finished. Word is out in surrounding villages that teachers are now being hired for the school that will open next month. Over thirty villagers worked all winter on the school. As the local Project Manager interviews prospective teachers, crews are working on the final touches -- drains around the building, latrines, painting and decorating the classrooms. The project, named “New Hope for a New Generation”, will provide education and opportunities for the children of an impoverished African village. Although they likely have no idea what a slot machine is, never mind the Internet, their lives will be forever changed by the generosity of the popular all-slots web site. 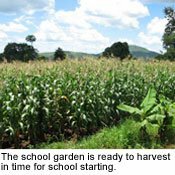 In the school garden, volunteers have planted maize, sweet potatoes, peanuts and casawa to feed the students that will soon fill the new school. The maize, a staple in Malawi, is now over 2 metres high and ready to harvest just as classes begin.